Leicester manager Claude Puel says he needs Riyad Mahrez to make a decision over his future after the Algeria international scored one and made another in the win over Huddersfield. "It was a fantastic game for Riyad. I like this player and I'd like to keep our best players," he said. "We will ask him the question." Mahrez, whose contract expires in the summer of 2020, put in a transfer request last May, but remained with the Foxes after Roma had a final bid of more than £27m rejected. The 26-year-old scored the opener against Huddersfield, expertly guiding home a side-foot volley from Marc Albrighton's up-and-under into the box. Seven minutes later he set up Islam Slimani with a precise though-ball and his countryman dinked a cool finish over Jonas Lossl. Huddersfield rarely threatened, with wayward shots from Tom Ince and Collin Quaner the closest they came to a reply. 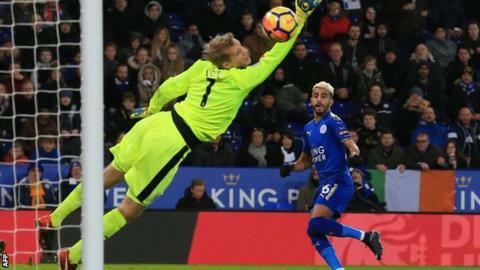 Instead the late stages were notable for Leicester midfielder Adrien Silva making his debut off the bench - four months after late submission of paperwork for his move from Sporting Lisbon left him unable to play - and Albrighton's injury-time third from Demarai Gray's deflected cross. While still short of the stratospheric standards set during Leicester's 2015-16 title win, this season's version of Mahrez has been a significant upgrade on the pallid variety seen last term. His goal was a superb demonstration of his technical ability, coolly steering an awkward dropping ball into the far corner from a tight angle. Mahrez's pass for Slimani's strike was made easier by the Huddersfield defence's kamikaze high line, but was perfectly weighted to send the striker clear of the chasing Terriers. Seven goals and seven assists in the Premier League this season dwarf his respective totals - six and three - for the whole of 2016-17. His upturn in form has been appreciated by the King Power crowd who gave him a standing ovation as he departed in the 77th minute. But it has also been noted elsewhere, with Arsenal among several clubs whose reported interest will be strengthened by this performance. Huddersfield fans who attended the club's last away game at Southampton were thanked for their support with drinks bought by defender Mathias Jorgensen. The travelling contingent have had little else to warm themselves on the road. This was the eighth time in 11 Premier League away trips that their side have failed to score. They rarely looked like bucking that trend against the Foxes. Danny Williams scuffed wide from the edge of the box in the visitors' best chance of the first half before Ince and Quaner efforts flew well off target. Boss David Wagner had set his side up with a high defensive line which, with Jamie Vardy absent with a slight groin strain, initially proved effective in keeping the less mobile pairing of Slimani and Shinji Okazaki at bay. Once Mahrez had scuppered any hopes of goalless draw and a point, however, Huddersfield lacked the quality up front to really threaten a comeback. It had initially been reported that, after enduring four months in limbo, Silva would have to wait another few days until he was be eligible for selection. Instead the Premier League gave Leicester permission to pick the £22m Portugal international and the scoreline gave him a pressure-free eight-minute cameo late on. Wearing 14 - the same number of seconds by which his paperwork was late in August - he came on for Matty James to the delight of the home fans. They cheered all eight of the touches he managed before the final whistle, but their chanted promises to invade the pitch if he scored came to nothing with Albrighton instead being in the right place to poke in a third. Leicester manager Claude Puel: "After the end of the first half, perhaps it was not enough - we lacked quality. We came back in the second half with the same spirit to play football on the floor and with quality. "We lost Wes Morgan and we will see his injury tomorrow." On Adrien Silva's debut: "He kept a good, positive attitude. It's a good thing to see him on the pitch and he can bring some good things for the team." Huddersfield boss David Wagner: "I don't think the players were tired. Maybe in the second half it looked like this was the case, but in the first half we played well. "We controlled the game and had the best chance of the first half. In the second half, we made an error before the first goal and left Riyad Mahrez alone. "Unfortunately we lost our focus and concentration, we were 1-0 down and had to open up, left some spaces, which they used. "I am gutted today because I think there was something in this game for us. In the end we have to say they deserve to win." Riyad Mahrez has now been directly involved in 14 goals (seven goals, seven assists) after 22 Premier League games this season; nine more than he had managed after as many games in 2016-17 (three goals, two assists). Mahrez has both scored and assisted in the same league game for the first time since February 2016 against Manchester City. Leicester are now unbeaten in 14 Premier League home games against newly-promoted opposition since losing 5-0 to Bolton Wanderers in August 2001. Marc Albrighton now has five assists in his last nine league games for Leicester - this after going 12 games without setting up a team-mate prior to this run. Islam Slimani has now had a hand in 10 goals (six goals, four assists) in his 15 league starts for Leicester. Slimani's goal was his first from outside the box in a league match since March 2016 for Sporting Lisbon. Huddersfield have now failed to find the net in eight of their 11 away fixtures in the Premier League - no side has failed to score more often on the road this season than they have (Brighton and Crystal Palace also on eight). Leicester travel to Fleetwood in the FA Cup third round on Saturday before visiting Chelsea in the Premier League the following weekend. Huddersfield are away to Bolton in the cup before hosting West Ham in the league on 13 January. Match ends, Leicester City 3, Huddersfield Town 0. Second Half ends, Leicester City 3, Huddersfield Town 0. Goal! Leicester City 3, Huddersfield Town 0. Marc Albrighton (Leicester City) right footed shot from the left side of the six yard box to the bottom left corner. Offside, Leicester City. Islam Slimani tries a through ball, but Marc Albrighton is caught offside. Adrien Silva (Leicester City) wins a free kick in the defensive half. Substitution, Leicester City. Adrien Silva replaces Matty James. Scott Malone (Huddersfield Town) is shown the yellow card for a bad foul. Attempt saved. Demarai Gray (Leicester City) left footed shot from the right side of the box is saved in the top centre of the goal. Assisted by Marc Albrighton. Wilfred Ndidi (Leicester City) hits the bar with a header from the centre of the box. Assisted by Demarai Gray with a cross following a corner. Corner, Leicester City. Conceded by Christopher Schindler. Substitution, Huddersfield Town. Laurent Depoitre replaces Tommy Smith. Attempt missed. Tom Ince (Huddersfield Town) left footed shot from outside the box is high and wide to the left. Assisted by Collin Quaner. Attempt missed. Christian Fuchs (Leicester City) left footed shot from outside the box is high and wide to the left. Corner, Leicester City. Conceded by Rajiv van La Parra. Attempt missed. Collin Quaner (Huddersfield Town) right footed shot from the right side of the box is high and wide to the right. Assisted by Tom Ince. Collin Quaner (Huddersfield Town) wins a free kick in the defensive half. Attempt blocked. Zanka (Huddersfield Town) right footed shot from the centre of the box is blocked. Assisted by Tommy Smith with a cross. Corner, Huddersfield Town. Conceded by Aleksandar Dragovic. Goal! Leicester City 2, Huddersfield Town 0. Islam Slimani (Leicester City) right footed shot from outside the box to the centre of the goal. Assisted by Riyad Mahrez with a through ball following a fast break. Substitution, Huddersfield Town. Collin Quaner replaces Joe Lolley. Danny Williams (Huddersfield Town) wins a free kick in the defensive half. Goal! Leicester City 1, Huddersfield Town 0. Riyad Mahrez (Leicester City) left footed shot from the right side of the box to the bottom left corner. Assisted by Marc Albrighton. Attempt saved. Islam Slimani (Leicester City) header from the centre of the box is saved in the top centre of the goal. Assisted by Marc Albrighton with a cross. Matty James (Leicester City) wins a free kick in the attacking half. Attempt blocked. Aaron Mooy (Huddersfield Town) left footed shot from outside the box is blocked. Assisted by Steve Mounie. Offside, Leicester City. Riyad Mahrez tries a through ball, but Islam Slimani is caught offside.